Notes from reading redwall books for the first time since childhood. Narrator: Some of this feels familiar. Aragorn: Hi, I'm Aragorn. Martin: I'm Martin. Aragorn and Martin: I'm here to reforge my broken sword so I can lead an army against the tyrant threatening my people. I live in a world of moral absolutes and racist undertones. Martin: Jinx! Narrator: It startled me when characters mentioned Satan. Redwall: "By Satan's whiskers..." Redwall mentions God, Jesus 0 times. Redwall mentions Satan, The Devil 4 times. Narrator: Harry Potter protesters, take note. Narrator: Even as a kid this bothered me: Why does everyone leave critical secret messages as simple riddles? It's silly to assume the intended recipient will be the only one to find and solve them. I would do things differently. 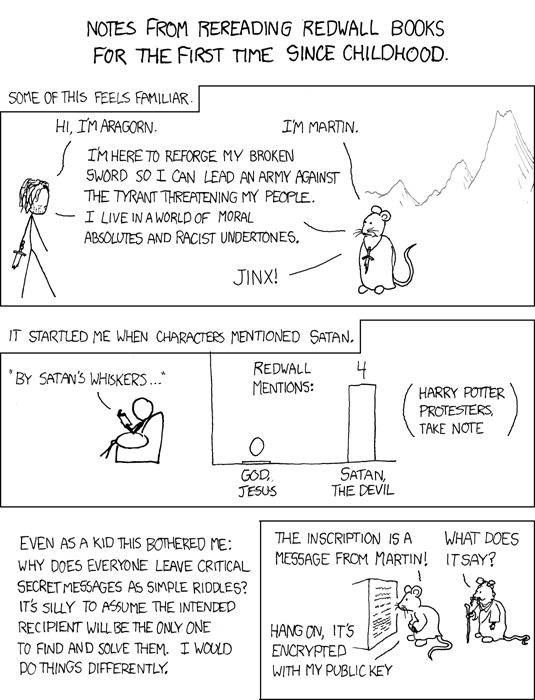 Mouse: The inscription is a message from Martin! Old Mouse: What does it say? Mouse: Hang on, it's encrypted with my public key.